It’s been a slow few weeks around here at Culturing Science. It’s due to a little bit of writer’s block, but mainly it’s just the beautiful weather keeping me outdoors and away from the computer. Hopefully you’ve been outside so much that you haven’t noticed. Are you sitting down? Today scientists from the Polytechnic University of Marche (Ancona, Italy) and the Natural History Museum of Denmark published their discovery of the first multi-cellular animals found to survive without oxygen. You’ve probably heard of Archaea or Bacteria species which are able to survive in extreme temperatures, acid, or sulfur-rich environments – places we wouldn’t dream of living. And the world at large is fascinated by them for this reason. For this study, the scientists collected sediment core samples from the L’Atalante basin in the Mediterranean. This basin is completely anoxic (oxygen-free), with a salty layer of brine above forming a physical barrier preventing any oxygen from reaching the area. In the sediment, they found traces of animals from three phyla: Nematoda, Arthropoda and Loricifera. However, as all the animals were dead upon analysis, they had to confirm that these animals were in fact living in the sediment, and hadn’t simply settled there in a “rain of cadavers” (What poetry!) from oxygenated areas of the sea. They treated the specimens with a stain that binds to proteins – presumably dead animals would have fewer proteins due to decomposition. In the figure to the right, we see little protein in the Arthropoda (a) and Nematoda (b) images. 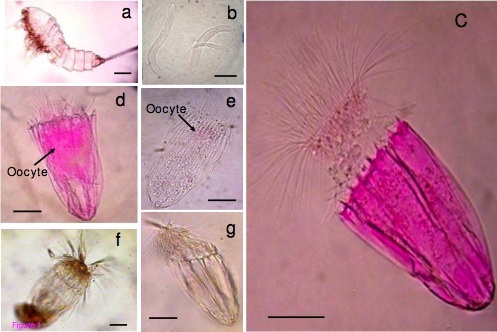 However, the Loricifera (c) specimen is bright pink, indicating protein. The arthropod and nematode species are thus probably dead bodies or shed exoskeletons – but the Loriciferan (unstained in f) shows promise of actual life in the oxygen-free sediment. After staining more specimens, the researchers also noticed eggs (d and e) within the bodies of the Loriciferans. This is a novel find because it suggests that these animals do not just spend part of their lifecycle in the anoxic sediment, but live without oxygen for their entire lives, including reproduction. They additionally found exoskeletons from young Loriciferans (g) suggesting that these eggs grow up in the sediment as well. While it would still be a new discovery to science if we found animals that live part of their lives in anoxic conditions, the fact that they spend their entire lifecycles down there raises many more questions and expands our definition of life on this planet. To further confirm that these bugs are living in the sediment, the team gathered fresh sediment samples and added radioactive protein to see if the Loriciferans would eat it. They traced this radioactivity and found that the animals had incorporated the radioactive substrate into their bodies providing final evidence that these guys are in fact living without oxygen. So what’s the big deal about a multicellular organism living without oxygen? Why am I nearly peeing myself over this? We already know about single-celled organisms can live in extreme conditions. Why is this so exciting? It makes sense that single-celled organisms would be more likely to survive in weird places because they can adapt to environments more easily. They only have one cell to take care of, so if that one cell is viable, they’re fine. In addition, single-celled organisms are more likely to transfer genes between one another, allowing adaptations to spread more quickly. But it was assumed that we don’t find multicellular life in extreme conditions because more complex life simply could not exist there. But now we have found a multicellular animal that can survive without oxygen. And the million dollar question: how did it evolve that way? In their findings, Danovaro et al. mention that the Loriciferans don’t appear to have mitochondria, which are found in oxygen-consuming animals, but rather hydrogenosomes, which are found in some single-celled organisms living in extreme environments. This presents the possibility of endosymbiosis – or the incorporation of one organism into the other. Endosymbiotic theory is widely accepted to explain mitochondria and chloroplasts in cells; perhaps this occurred another time for the hydrogenosomes of the Loriciferans. This suggests that maybe this is not as rare of an event as we thought – who knows what other organelles have evolved this way, including ones we haven’t identified yet. But let’s get down to the real business: let’s talk about space and aliens. Thus far, we have been primarily searching for alien life based on oxygen because we have lacked proof that complex life can exist that isn’t oxygen based. The only life we know – us – is oxygen based, providing no other models of life besides planets with oxygen. The prior knowledge of only single-celled organisms living in non-oxygen based environments suggested that intelligent life cannot exist in those systems. And while I wouldn’t consider Loriciferans (also known as “brush-heads”) intelligent, they do suggest that non-oxygen substrates can support higher life. So when looking for aliens, let’s stop being so anthropocentric. Life can survive without oxygen.